Bruce Banner lives, and so does the Hulk—more fearsome than he’s been in years. Two years ago Bruce Banner died, and with him, the Incredible Hulk. And then suddenly, that wasn’t the case. Bruce Banner came back, and brought the Hulk with him—but death changes a person, and that remains the case whether you’re a man or a gamma-irradiated monster. Although the Hulk has actually returned again since Secret Empire—in the recent mini-event series No Surrender, which established that his ability to cheat death is now just another byproduct of being the Hulk—the launch of The Immortal Hulk today, by Al Ewing, Joe Bennett, Ruy José, Paul Mounts, and Cory Petit, is the first time we’ve really gotten to see the impact this latest resurrection has had on Bruce and his relationship with his greener half. Not before we get to see him die again though. The aftermath of a robbery gone horribly wrong. The Immortal Hulk #1 primarily deals with the fallout of a gas station robbery gone wrong, which leaves three people dead: Bruce, the cashier, and a 12-year-old girl. To the local police, Banner is just a John Doe instead of a former Avenger, and to Thomas Hill, the armed robber, he’s just another dead face for him to remember as he struggles to claw his way out of debt with a local gang. But Bruce’s anonymity in death doesn’t apply to the Hulk, and it certainly doesn’t influence the big green guy’s attitude. Because this latest version of Hulk, perhaps taking a grim influence from his newfound ability to never actually stay dead, is a horrifyingly dark one. That’s a grin you never want to see. Upon his latest resurrection, the Hulk promptly hunts down Hill, laying waste to the gang he’s indebted to, like some creature out of a horror movie instead of one of Earth’s Mightiest Heroes. And when he corners Hill, he needles him over the death of the young girl in his crime—but it’s less like eking out a sense of justice and more like playing with Hill. This Hulk fully accepts his monstrous nature, and revels not just in the power it brings, but the fear it instills in people. For now, the Hulk is still using that power in what could ostensibly be described as vigilante justice—after all, his attack is driven by the death of an innocent young girl, not out of an aimless rage. But is it justice if there’s a trail of destruction left in his wake for the local law enforcement to clean up? Is it justice if the Hulk leaves his foes so horrifically smashed up that they’re likely to be comatose for the rest of their lives? 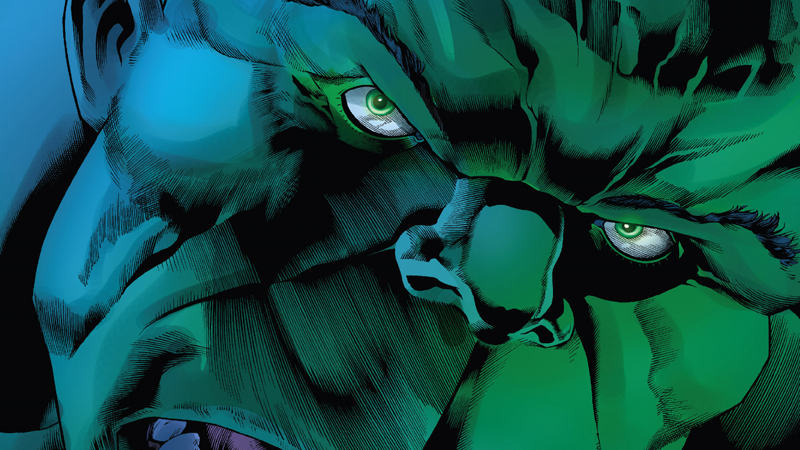 The vengeance enacted by the Hulk in this issue might ultimately be altruistic in its intentions, but what happens when it isn’t—and now, not even the threat of death can stop him? It’s a question Bruce ponders to himself as the issue comes to a close. Can he still call himself a good man when the monster inside of him seems more brutal and in control of its own impulses than it has been in years? Again with the creepy grin, Hulk! We don’t know if he has an answer to that, or not just yet, but the Hulk might have some thoughts about it.